Discussion in 'Computer Audio' started by jude, Jul 5, 2012. Apparently they require 150 hours of burn-in to work..
Maybe that was part of my problem. Oh well, maybe I'll get one again sometime or get the newer models when they drop. Who knows. I have been enjoying the Dragonfly (v1.0) for well over a year. A strange thing starting happening with my desktop (a Dell PC running Windows 7) a few weeks ago. When I unplug the Dragonfly from the desktop, you can hear the hard drive spinning fast, and then the desktop shuts down. This does not happen with my laptop. I know that I am not providing enough detail for a diagnosis, but I wonder whether others have experienced the same problem: you unplug the Dragonfly, the computer shuts down. You're kidding me, right? 150 hours? That sounds like a salesman trying to ensure that the unit is kept beyond the return period. Don't bother. I gave it multiple over-night runs and a lot of hours and I still heard no difference between 2 computers and 1 phone (3 devices total). It only gave me more volume but it certainly did not change any quality or add any bass or soundstage etc. Anyway I returned mine today. For $150 you'd think I'd hear at least a small difference. But nothing. Drivers were working properly and everything. The only thing I see this useful for is if you have a very power hungry headphone and you need the extra volume on-the-go which it would definitely work for. I'm not an engineer but I don't personally understand what a 150 hour burn-in would do for a computer chip. All it is is a green chip with some circuitry. Why would that need a burn in? Also sounds scammy to me. I will stay away from this company in the future. My Dragonfly 1.2 powered by Wyrd sounds awesome! 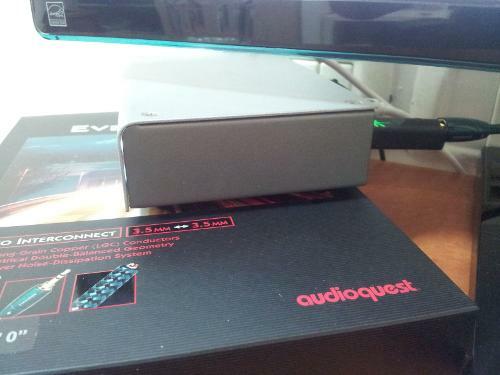 Connected with an Audioquest Evergreen 0.6M 3.5 to 3.5 to Headroom ultra micro amp and HD800 (which both are out of the picture). I were supposed to get a Dragontail together with the interconnects (3.5 to 3.5 and 3.5 to rca) but they accidentaly sent me another adapter, they are now sending me the Dragontail in the mail, so for now I am plugging the DF directly to the Wyrd. How would you characterize the sound difference with / without the Wyrd? To tell the truth,I haven't made much testing with and without it,cause since I got it all my dacs (Dragonfly,modi uber) is always connected to it. There won't be a big,or even noticeable difference if you have a well working usb ports,But I still prefer to use it since I don't really trust the usb ports..at least not 100% of the time. Wyrd just helps to assure that usb powered dac's performance is maximized. But I can definitely say that with my current setup,the sound is surprisingly good for the cost. I believe that the Evergreen interconnect has something to do with it also. Anyone has thoughts between the dragonfly and the Schiit Fulla? The USB design seems better than the Fulla external cable. The power should be enough to drive my Gr07. I am also interested in the fulla/dragonfly comparison. So they do or don't require 150 hours of burn in? Your two posts say the complete opposite. I did let this thing burn in for about 10 or 12 hours straight (at least) and I still heard very little difference. It wasn't like I just pulled it out of the box and started testing. I kept it for a full 2 weeks and let it play all the time. Didn't seem to make that much of a difference. As far as I know the AQ Dragonfly doesn't require any burn-in. IMO it did produce a positive audible difference in sound quality when plugged it into my MacBook Pro while using my headphones. Sorry I should have been more direct in my post. What I meant to say is that that Audioquest claims the Dragonfly needs a 150 hour burn in. But in my experience it did not change or help them. That was my experience as well. Glad to know I wasn't the only one. It certainly makes a difference in my MacBook Pro, both in terms of volume and soundstage. Especially, with my AKG's, possibly it is more noticeable with different equipment? AKGs are notoriously hard to drive so any amp is going to do those headphones a lot of good.